Be part of this biggest tech conference. Register at geeksonabeach.com. One of the favorite geeks at Geeks on a Beach is Tonyo Cruz (tonyocruz.com). Last year, he was our speaker for “Rise Up From Disasters: Tech to the Rescue.” He’s a social & political geek that got hold of technology, and the results are what we call the “modern uprising” causing positive mass movements. How did you get into digital publishing? I started blogging as soon as my my friend Ederic Eder introduced me to it in the early 2000s, switching platforms until I made it to Blogspot. I wrote mostly about politics and technology, an odd mashup that reflected my twin passions — activism in both political and technology consumer fronts. Thanks to blogging and social media, I’ve been to places and helped open the doors for me and my causes locally and internationally. Whether working in a creative or digital marketing agency, or helping non-profit or causes, or spearheading social media events, or being asked to write for a national newspaper — both my blogging and social media background have been a big help. Can you share tips on how you carry a “trend” from online to offline? #RescuePH and #ReliefPH have been described as outstanding expressions of Filipino social media and tech savvy — and rightly so. They were started by people like you and me, who just wanted to make sure everything is done to save and help people during disasters and calamities. They have become unified hashtags used by real people, real agencies and real organizations during real events to solve real problems. Behind these hashtags are teams of social media experts and tech geeks who marshal tech know-how to make things happen quickly — whether helping automate crowd-sourced reports so agencies and organizations could respond quickly or promoting their proper use every time there is a need. In August 2010, just after the Luneta hostage incident, my friends and I started tweeting memories of our 80s childhood using the hashtag #sentisabado. It spread like crazy and became a welcome respite to the bad news that happened that week. It was arguably the first organic Filipino trend on Twitter. For startups or businesses, can you share tips on how to use digital media as a way to promote their service or product? Social media provides Philippine startups and business many opportunities: seeking crowdfunding, seeking out ideas for a new business, fulfilling a need, testing ideas and checking feedback, and finally promoting their ideas. Bloggers and social media users are fans of innovation and entrepreneurship. We all have a soft spot for Filipino startups who dare to make a difference. There will always be willing evangelists of the things startups want to do and achieve. Like blogs and social networks, our startups and businesses don’t exist and function in a vacuum. We have to know what’s happening, whether about current events or about areas with good (or bad) internet connection and infrastructure, technology education, venture capital and angel investors, business registration processes, taxation and regulations. We have to know these, and help change them for the better. For those wanting to make a name in digital publishing, what insights you can share on how to get the Filipinos’ attention / sentiment? GOAB 2015 happens practically on the eve of what we hope is big and positive change for the Philippines – the national elections. Social media and the digital space is at the same time simmering with ideas, innovation and trends that – perhaps with a nudge here and a push there – could help bring about change-making new startups or old startups venturing into new changemaking ideas. More than a “wait and see” attitude, maybe Philippine startups could take a page from what Silicon Valley counterparts do: Promote their interests, seek out the candidates, and help make the process more inclusive, more participatory, more exciting, more tech-savvy. What can be more compelling? For if Filipinos are world leaders in social media and a rising star in startups and tech entrepreneurship, it is about time we have Digital Leader or a Tech President. That won’t happen if we don’t dare to listen, speak, get involved, and make our communities relevant in this big exercise which we all hope would be changemaking and history-making too. 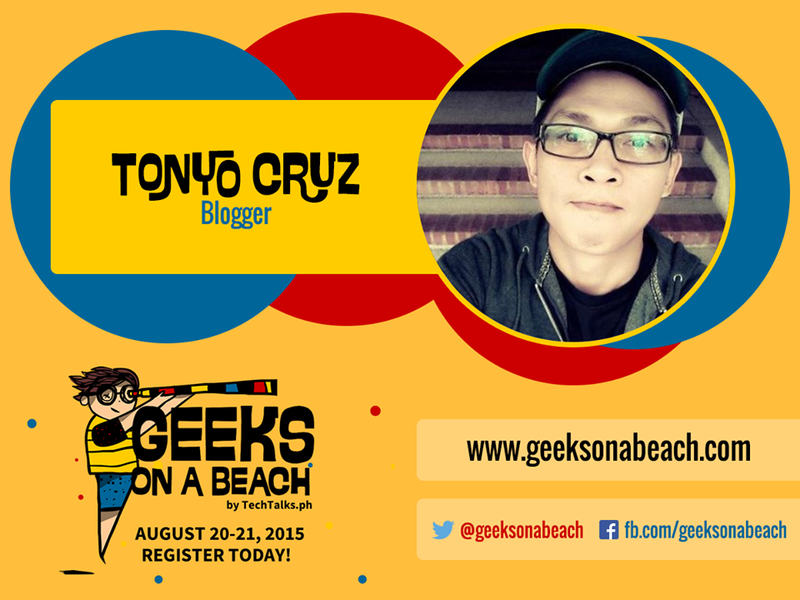 Join us this Geeks on a Beach this Aug. 20-21, 2015 at Boracay, and have a stimulating discussion again with Tonyo Cruz. REGISTER now at GeeksOnABeach.com. © Geeks On A Beach. All Rights Reserved.